This site is about my life in Canada and everything else around us. To see what we are doing mostly look at the map below. Every place we were and it was worthy to remember I put into map. I would like to introduce my little project, which I created to map my life and have record for me. As much I like maps I’ve decided to do this with mapping tools. I believe it can be useful for everyone. If you have any question about some place, hike or whatever just write a comment or shoot me email. Place – for any natural point of view, great for picnic, taking a photo a anyhow interesting. Hike – recommendation for any hike, short, long or overnight. Camp – for any place I was camping or just spending night, It can be commercial camping or also free camping. Entertainment – for any type of cultural or funny activities, not falling into “place” category. Road trip – created for days when you have feeling just go somewhere by car, listening music and enjoying nature form car’s view. Food & beverages – during our trips, vacation or just during regular week we used to visit many cafes, bistro or cozy restaurant. I am not fan fancy dancy club, party or big restaurant or chain. Mostly I prefer local, nice and small food or drink place. All places on the map are linked to blog posts which mostly are written in czech, but for those who don’t understand the most important part is huge photo gallery or record of trips, routes or trails. We’ve visited many place already in Alberta, BC, Montana. So map is still developing and much more interesting spots are coming! 2015 July - After great hike at Kootenay NP we were looking for place for overnight camping. First intention was to find wild hot spirngs: Ram Creek, but unfortunately we didn't that time. But on the way we found nice spot for camping. exact location is were the marker is. Our fun in the pictures you can see at the gallery. 2015 September - We finally found the Hot Spring there.See here. Headwater Lakes - Free Camp Camp & accomodation 2015 August - Headwater lakes free campsite is the one, which we can recommend to everyone. Camp is for free, nice sustained, by the lake, easy accessible, fire pit, tables, toilets. Photos from this camp are available here.Photos from this camp are available here. Postill Lake - Free Camp Camp & accomodation 2015 August - Great campground with a lot of campsites. We came there a late at night and some people already had there a party but still we found nice spot with table. We had little bit hard time with finding, but worthy. Few pictures from the camping at Postill Lake are available here in the end of the gallery. Cabin in the Country-Mountain Views Camp & accomodation 2015 August - We have started here out trip to Yellowstone - beautiful cabin we have booked by AirBNB. If you have any question or you want recommendation, let me know. It's great cabin for cheap price. Good for four people.Pictures here. AirBNB in Rexburg - West Entrance to Yellowstone NP Camp & accomodation 2015 August - Another place we booked through AirBnb, if you need any advices or more detail information you can write me message. It was nice, cheap, but maybe what we didn't imagine in the beginning it's that was quite far from Yellowstone park, and it was lot of travelling back and forth.Look here at this article with tour plan. Cabin in Kootenay - AirBnb Camp & accomodation 2015 August - Another accommodation we have booked with AirBNB during our holidays. It was very small cabin, for longer stay I recommend just for couple + max. 2 small kids. We were there just one night four adults, but we somehow managed it. Anyways hosts were very kind, we could pick whatever we liked form their garden - and they have a lot of veggies and fruits. For more information you can ask me in private. Photos here. 2015 August - We had the best host ever on Airbnb, if you are looking for good, but cheap accommodation for 2 to 4 people in nice Peachland at Okanagan Valley, I can more than recommend. They have big garden and orchard. Very nice suite for guest. Visiting this place was part of our big road trip here. 2015 August/September - Nice, small suite in the house. We had one room with two queens size bed and also living room to share. It was very small for 4 adult, but we didn't spend there too much time. Form there we were doing trip to Jasper, so almost all the time out. I am recommending for short trip and just two people plus max. one kid. Part of our big road trip. Nice accommodation in Chalet.Was very nice and Cozy! Great place for going hiking. 2015 October - We found nice space for camping close by Elkford Hot Spring Lake. It was cold and rainy so we didn't try water. Big lake also maybe you can swim there, but it's not that hot like other hot springs though.Some photos in this article. 2015 December - Our accommodation during Christmas holidays. We spent two night in Golden in the cabin. My recommendation you can read at AirBNB sites, but it was just great. I hope I will have one day same cabin 🙂 . Our Christmas holidays are in the end of this article. 2015 December - Nice accommodation in small, medium & large chalets. We had very small one, but for our two nights was ok. For guests accommodated in chalets you have all day pass to hot springs free. Nice, quite & enjoying. In the end of this article you have some photos from our Christmas trip. Waterfall Hike I don't even know name but nice place for short hike. From very beginning is very steep. I can recommend: take water straight from the waterfall. Bowmont Park Natural Area Hike Nice urban hike - one of my favorite! We walked around 5km but you can do shorter or also longer. Up to you. Great view at Calgary downtown or Calgary Olympic Park. Fish Creek Provincial Park Hike The biggest provincial park in Calgary. Great for biking, walking, running or inline skating. Park is huge and it's great if you don't want go outside of Calgary. We did almost 6km, so I very recommend for urban hiking with kids or just lazy days. 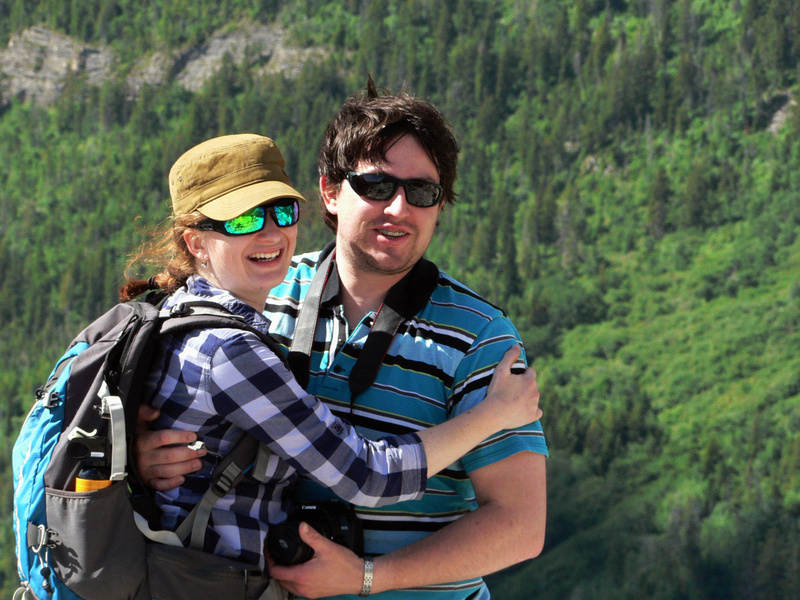 Johnston Canyon & Ink Pots Hike Most common, most crowded and also the easiest hike you can get. But on the other hand is always beautiful. It's shame that I was there twice but always in the winter, never in the summer, but all season are amazing. My recommendation is to go there during week days, otherwise you can get grumpy from all that people there. Don't finish you hike at the Upper falls, hike futher to the Ink pots, hike there is not that crowded anymore and small pots/lakes are amazing. Troll falls Hike Short hike great in all seasons. I was in winter. Except fact that route was pretty slippery, it was very nice hike. We had trouble with finding the trail but in the end made it. Great hike for small kids. It's very close to Nakiska Ski Area. We parked our car right in the main parking lot. 2014 December - Look at the photo gallery at my blog post about first Christmas in Canada. 2015 March - Winter walk around Emerald Lake, great in all season. 2015 March - Short hike to great Wapta falls.We had hard time to find the starting point to the hike. Look at this link and you will find route how to get there and also some photos. 2015 April - Great adventure, good to take bike with you can bike long gravel road, which is quite boring just walking. My impression from the Ice cave you can see the best in the gallery - we spend there great time. 2015 April - Great hike for spring. Mostly people do lookout around 12-15 km, but we also hiked on top of Mt.Yates (2000 m above see level) and together was around 19 km. All photos from this hike at Kananaskis you can see at this article. 2015 May - Medium long hike, but very easy in the Kananaskis Mountain. It's close by Calgary, on same way as Bragg Creek but little bit further. Look at this article - nice photos from hike. 2015 May - Great shirt hike to amazing emerald colored lake. Can be crowded because is short, easy and nice, but If you've never been there, try it.Just one hour walk. Nice pictures you can see at the gallery. 2015 May - Short and steep hike. Very crowded, but it's good to start earlier you run on top and there are beautiful views. Many people they have no experience with hiking at all, so be patient! Great gallery at this article. 2015 June - Popular hikes with mark "crowded" it's here a lot, but this hike is mine number ONE! Beautiful, awesome views, not too long, it's loop - so you don' t have to come back same way and also there is not many people on the hike.Very recommended and one of my MUST SEE, MUST hike, at least once in two years - haha. Look at the gallery for beautiful pictures from June. 2015 June - In June we visited first time Waterton NP, we didn' t have too much time, so we did the top tourist places. First was short hike to Bear's Hump - from top nice view on Waterton. 2015 July - Great hike at Kananaskis, not very popular. Parking lot was full, but everyone went to Chester Lake. You can even connect those two hikes together. As you can see at the route of our trail at this article we get lost. Be carefull the route is not market so you need great maps have with you. We find the way finally because our great offline maps at the phones. 2015 July - Long hike to Floe Lake at Kootenay NP. This hike is very common for overnight/backpacking hiking. We just headed to Floe Lake and then we went back and it was already more than 20 km. But most of the people there continued the trail next day. At Floe Lake is campsite and everything ready for awesome picninc and camp. Sulphur Mountain Hike 2015 August - First at Sulphur Mountain, but we just took a Gondola on top. We didn't have time much, but was great weather for views. On top oh the hill is nice walk with great views. Look at the pictures in the beginning of the article here. 2015 September - great hike in jasper NP around 8.3 km. We had very bad weather so we made it just to the Cavell Pond. In this point there is many educational boards about avalanche which caused floods in the past. While we were reading about this we have heard enormous sound and actually right after big rock was falling down straight to the pond. You can see at the photo, right after access to this hike was closed at least for the day. See photo in this article. 2015 September - Nice viewpoint on the Icefields Parkway. I can't call it hike, it's just short walk that everyone is able to hike. Take you families! Some picture in this post. 2015 September - Great hike, great views! It was around 14 km loop. You can see photos in this article, there is also gpx record. 2015 September - Beautiful hike in the icefield area. Not known too much, so You will hike in small group. This hike can have from 14 to over 30 km. There campsite for backpacker on the route, you can choose which one you want to hike. In this post I have record my route and you can see some photos. Banff - town Place As everyone now probably Banff is great town, crowded with tourist, but on the other side centre of everything. Great restaurants, hotels (Fairmont Banff Springs), museums (Cave & Basin), main Banff Avenue with shops, gift shops, cafes and others. Also starting point for many outdoor activities: Kayaking, hiking, biking, skiing and others. Atlas Coal Mine Place Great trip for families or the one who likes little bit of history of Alberta. Alongside you can visit also ghost towns which are strongly connected in the history. Royal Tyrell Museum Place I was there twice so for and still I didn't read everything, I haven's seen everything. Is so interesting to everyone, interactive for kids and I like the part when you can see and learn how the evolution went. Great for rainy weather. Elbow falls Place These falls are great for picnic, photo shooting or from this point you can go hiking along river side or little bit higher to Moose Mountain or Prairie Mountain. Marble Canyon - Kootenay Place One of a great place in Kootenay NP. I was there in the winter, but for sure I am coming back there during warmer months. Great for photoshooting, short walk or also climbing! 2015 January - Photos from winter Marble Canyon you can see at this link. Paint Pots & Ochre Beds Place One of nice walk in the Kootenay NP. Great for summer or fall. I was here just in the winter and all the beautiful pots, lakes were under snow, but still nice walk though. 2015 January - for more winter photos from Paint Pots see in this photo gallery. Yeah! Vancouver - big city in BC, I think everyone was there, but I've never inclined to big city, so I have decided to go to Vancouver, but just on my way to Whistler. I was in Vancouver first time in February 2015, but weather was already very nice, so we rent a bike and spend all day at Stanley Park. 2015 February - great pictures from winter biking at Stanley Park look at blog. The best ski resort I've ever been in Canada. Little bit crowded, but it's very spacious so people are spread around. Price is bit higher (esp. ski rent) but worthy. 2015 May - Spray Lake is awesome place for picnic or camping. We went there after hiking Ha Link Peak, we took BBQ with us and spend there awesome evening with friends in the nature, no people just wild. 2015 June - Our first visit to Waterton was short and we didn't have too much time, but we chose the top tourist destination. One of thous was Red Rock Canyon - it's beautiful, but I don' t think so I will ever go there again, not at least in close future. Too many people for me which spoil impression from all the natural beauty. Photos you can see in the gallery in this article. 2015 July - Nice place for picnic or little chillout, swimming etc. See at the gallery last few pictures. Gyro beach - Kelowna Place 2015 August - Kelowna is favorite place for spending long weekend out of city. Many places for outdoor activities, swimming, camping etc. In the summer our best beach at Kelowna is Gyro beach. See some nice photos in this article. Boiling River Place 2015 August - In the North Entrance to Yellowstone. It is natural hot spirng just next to cold Gardiner River. You can take a bath there and it's amazing experience from others to commercial spots in the Yellowstone. Photos from Yellowstone. Canyon Village - Yellowstone NP Place 2015 August - Great spot in the Yellowstone. Not just Canyon Village but especially all river canyon and their viewpoints and lookouts. Nice lookout on Upper and Lower Falls. Photos in this blog article. Norris Geyser Basin Place 2015 August - At Norris Geyser you can see the best volcanic activity and best from the best of Yellowstone. We did two short lookout and it was simple amazing. Just don't forget water with you. We did, and second lookout was already quite long and far and in the very hot day as we had it was tiring! Amazing pictures in this blog article. Firehole Lake Drive Place 2015 August - Firehole Lake Drive is nice, We were waiting for Great Fountain Geyser eruption. Some photos at this gallery. Grand Prismatic Spring Place 2015 August - The most amazing lake in the Yellowstone, is the most photogenic place on each postcard. And in fact is even more beautiful than in any photo. Look at my pictures. Old Faithful Place 2015 August - The most known Geyser at Yellowstone. We were watching eruption it was nice, but for me I wouldn't go again there. Too many people there, crowded and in the Yellowstone is much more better place to visit. Old Faithful Geyser. 2015 August - Nice outdoor activity in Okanagan Valley. This area it's not just about tasting wine, sunbathing by the lake or paddle boarding... You can go also to the mountains and Myra Canyon is one of trip is worth to visit. Great place for family hiking or biking along with educational and historical pathway. This place was part of our big road trip. Picture you can see here. 2015 September - One of our great adventure! I recommend everyone to spend the money here. (In the Icefield Parkway you have other attractions like Icefiled Skywalk but this are not worth to go there and pay.) We paid for bus trip to Columbia Glacier and then walking on the Glacier and it was really nice experience. We were there in the beginning of September, but was around 0 degree and snow. Part of our huge road trip in 2015. 2015 September - Great viewpoint for photographers! Edomonton - West Edmonton Mall Entertainment Maybe little bit weird that I have this big huge commercial building here. I couldn't just put into category place, there are mostly natural places. The biggest mall in Western Canada, once was even the biggest in the world but for sure not anymore. There is amusement park, aqua-park and lots others entertainment facilities. 2014 December - whoever never visited Edmonton's mall, look at the gallery! 2015 August - One of the better commercial hot spring we have visited. The most excited feature in this Hot Springs is great cave with warmer water. Pictures from the whole road trip are in this blog post. 2015 September - Nice and calm commercial hot springs in Jasper. Closed for the winter season - due to access and snow condition. 2015 September - I finally found the best Hot Springs. It's very hard to access. I didn't put marker at the right place, if you are interested to find it, please feel free to contact me. Some photos are here. 2015 April - One of my favorite Hot spring in BC. Pools are for free, you can park right above the pools. But unfortunately this destination became very popular now and is much more crowded than used to be. Great come early in the morning or at night. We were therein very bad weather but still quite few groups of people we met there. Great photo of our adventure with BBQ at Whiteswan Lake see at the gallery. 2015 August - This winery is MUST to visit, but I am not sure if it necessary to BUY there any wine. At the Valley is much more better tasting winery at not that much expensive. But Mission hill is huge and very nice, I think that all family did great job there. Picture form the winery you can see at his blog as a part our road trip. 2015 July, August, 2016 September - We have already visited three times and always if we go to Okanagan Valley we will visit again! Small and so huge commercial Vineyard, although they have perfect advertising & marketing. Their wines, especially the red wine are amazing and worthy to buy them and carry to Calgary. In the main photo is their most popular red wine: Big Bang Theory. Our road trip is in this article. 2015 August, 2016 September - Nice and very small winery with organic wines. When you compare with Mission Hill which is almost in neighbourhood it's very small, but also less commercial. Our road trip you can see at this gallery. Smith-Dorrien Trail - Spray Lake Road Trip One of our favorite road trip form Calgary when weather is so so and we just don't want get out from the car for too long. On the road is many places to stop and take a photo or great place for picnic. Dinosaur - hoodo - coal road trip Road Trip Another great long round road trip from Calgary. Going east you don't see mountains but also there the countryside is amazing. First you can see lots oil pipe, then badlands & hoodos or many ghost town with old coal mine. Finally you can finish your day at huge Tyrell dinosaur museum. 2014 November - All road trip is sketched and describe in CZE in this article. Dinosaur road trip See in the article also many photos. Lake Louise - Lake Abraham Road trip Road Trip For those who like longer road trip this one is my number one! 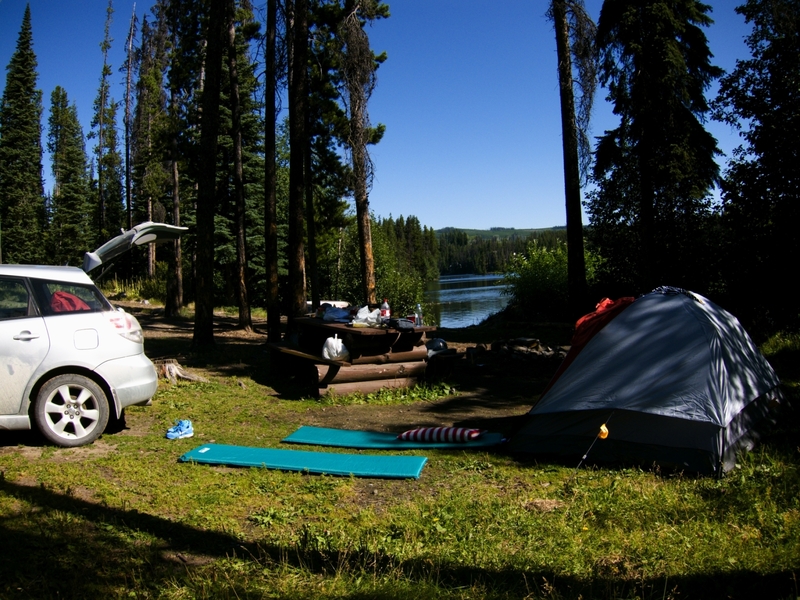 You can split between two days if you like with nice camping at the Abraham Lake. 2015 January - All route on Google maps and all the interesitng thing on the road you can see in the blog post.